Do we still have unimaginable potential just waiting to be unlocked? 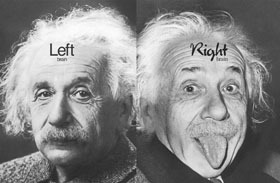 The human brain includes right and left hemispheres. These operate in different contexts as they perform different functions. In most people, the left hemisphere is primarily detail-oriented, while the right hemisphere is visually oriented and recognizes patterns. The sense of time passing at a fixed speed. The translation of visual images from the right side of the brain into words. Spatial awareness – the ability to imagine, and operate within, three-dimensional space. Whole picture overview – the recognition of patterns of light, sound or thought. Dealing with thoughts in their natural, symbolic form. Artistic ability – visual imagery. The reception of intuitive impressions. In education, the left side of the brain is promoted much more than the right. Much attention is paid to arithmetic and word skills, while art and music receive little, and intuitive development doesn’t get any. When you drive at a constant speed, your right brain, with its spatial awareness, monitors the road ahead for pattern changes. If you engage in a conversation while driving, using left-brain word skills, and something in the traffic pattern requires your attention, you have to switch your primary focus over to your right brain in order to deal with it. This explains why conversation stops as you attend to making a turn. The turn doesn’t require that much attention, but it does require a whole switch of brain sides, so the conversation stops for that short time. Music naturally resonates with the right side of the mind. 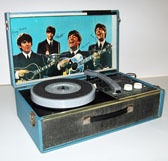 Did you ever sing along with a Golden Oldies song, one that you hadn’t heard for years? Weren’t you amazed at how many of the lyrics you remembered? How could you possibly roll out, from memory, line after line of lyrics that you hadn’t heard in years? The answer lies in the right brain, where music is experienced and, also, memories are stored. You never had to use your left brain to laboriously remember the lyrics. When you heard the songs, they played into your right brain and were automatically stored in your right-brain memory, waiting to be recalled, sometimes decades later. Right-brain development can include artistic and musical ability, which can be used to make your immediate surroundings look and sound beautiful. To see how art skills turn on the right side of the brain, try drawing a picture of your left hand, only without looking at the paper you’re drawing on. As your right hand draws the outline of your left hand on paper, there will be a point at which your thinking flips over to the right brain. You’ll probably start the drawing in a linear style that prefers simple, straight lines, then suddenly switch to a more complex style that sees all the slight curves and details, appreciates their beauty, and starts to include them. Quality of life can be enhanced enormously with more right-brain attention. Imagine, the luxury of living in a world where communities are designed to calm your senses and inspire you with the sights, sounds and smells of a beautiful environment. Your spiritual connection is developed through the right side of the brain. Meditation provides inner peace and the development of intuition, which, in turn, provides necessary insights into your life’s path. Now, there could be many light-hearted answers to this question – abilities like perseverance while shopping, holding long, meaningful conversations, and – most of all – being able to ask for directions when lost! However, the biggest difference is women’s intuition. It’s not that men don’t have intuition, it’s just that women tend to have more of it. In order to develop our latent abilities, and our spiritual potential, we need to feel our way into a deeper experience of that feeling-oriented, right side of the brain, just as we have thought our way into developing the word-oriented left side of the brain. We need to become more accustomed to using the language of the right side of the brain. The right brain uses symbols and pictures, not words. Symbols can be visual, and they can be complete information packets – thought balls, which are whole pictures containing thoughts and feelings. To operate in the right brain means to grasp concepts without words, feeling them, knowing them, letting the left-brain logic wait until our sense knowingness has had the chance to become more than it was before. If you are new to the art of paying attention to your intuition, then you will need a little practice before proficiency is achieved. Your initial attempts may seem like failures, but that’s only to be expected at the outset. Practice by being receptive to the “still, small voice within” of your intuition. The more you pay attention to your intuitive insights, the more you grow to realize how profoundly correct they are. Practice makes perfect, and a you’ll achieve good results a lot sooner than you might expect. Just keep track of all your insights and, with a little dedicated practice, you’ll be amazed at their accuracy. This entry was posted in Metaphysics, Owen K Waters, Spiritual Dynamics on July 2, 2016 by Owen K Waters.